When it comes to living spaces, size doesn’t always matter. Especially for young professionals, location is a more important factor than the size of the apartment as the cohort is more concerned with proximity to jobs, restaurants and other sources of entertainment, a recent RENTCafe report found. The proof is in the numbers with the average size of new apartments (those completed in 2016) now at 934 square feet, 8 percent smaller than those 10 years ago. Using Yardi Matrix data, the report examined changes in U.S. apartment size in buildings with at least 50 units over the last decade. Results showed that all property types have seen significant drops in size, but studios have seen the steepest decline. While an average studio in 2006 was 614 square feet, the average size is now 504 square feet. In contrast, two-bedroom apartments saw the least change in size. 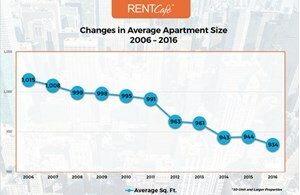 The report cites the Great Recession as a key factor contributing to shrinking square footage, as rental stock and multifamily investment declined going into 2010. “Not only were there fewer units delivered, but those that came online were also smaller in size—a trend that continued even after 2012 when the rental markets started seeing inventory growth again,” the report noted. And while this shrinking trend in nationwide, there are some stark differences depending on the market, the report said. Rentals in southern states still have the biggest apartment sizes in the U.S., averaging 974 square feet in the Southeast. The Texas cities of Plano, Houston and Dallas were among the top 20 list of cities with the largest apartments in the U.S., but Atlanta topped the list with the most sizable rental units overall. For studios in particular, Norfolk, Va., tops the list with an average studio size of 591 square feet, followed by Irvine, Ca. (586); Plano, Texas (578); and Atlanta and Jersey City, N.J. tied for fourth at 570 square feet. On the other hand, the West Coast largely offers the smallest apartments, with an average size of 843 square feet in California and 852 in other Western states. Arizona’s Tuscon, Glendale and Mesa are among the top 5 cities with the smallest apartments, joined by El Paso, Texas, and Buffalo, N.Y. California’s Bakersfield, Stockton, Fresno and Chula Vista are also four cities with some of the tiniest apartments in the nation. But while apartment size is shrinking, rents are not following suit, the report noted. The national average hit a record $1,204 in May and coastal residents will still be paying the most, with San Franciscans paying about $2,500 for a 500-square-foot studio.